Those seeking term life insurance at 51 years old often have one thing on their mind: the financial burden that they would leave their nearest and dearest should the inevitable happen sooner than planned. 51 years old is still a relatively young age to buy an insurance plan at a reasonable rate, particularly if you still have a clean bill of health and look after yourself. You may even wish to insure your dependents at 51 years old. Whatever your reasons for buying it, you will certainly have several options at affordable prices. There are two options: Term or whole life coverage. 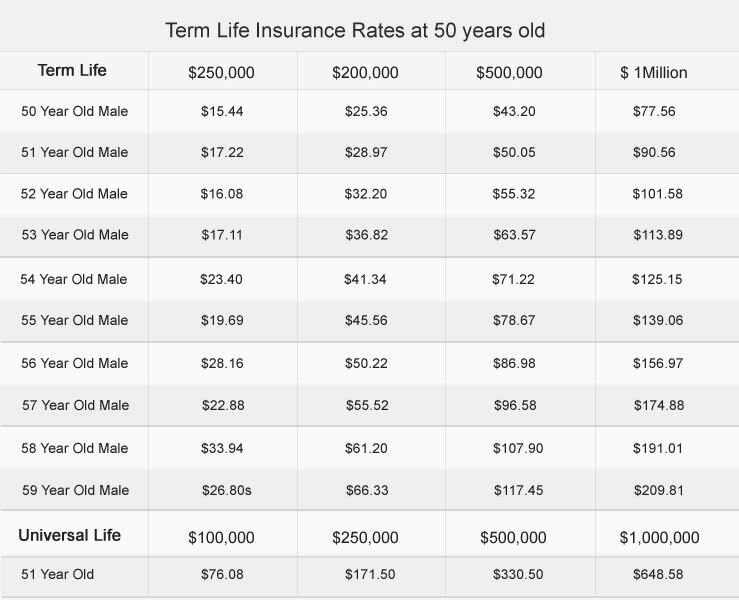 Term life, as the name suggests is for a certain term or length of policy and is temporary for this term which is specified by the policy holder. This is a more affordable coverage option and allows for greater flexibility as you can revise your policy choice when the term expires. Permanent or whole life coverage lasts your entire lifetime, provided the insured maintains premium payments. These are more expensive policies but they also accumulate cash value and you can borrow money against your policy, so they are useful from an investment point of view. The rates are calculated after taking several aspects into account. The actual rate will depend on certain variables such as your lifestyle choices, state of health, occupation and the outcome of a Paramedical examination, which is a standard part of the underwriting process. Life insurance at age 51: Why wait any longer? It is of imperative nature to check all the given options. You will be paying premium rates for anything from 5 years to an entire lifetime, so it’s important to get it right from the start. Rates will vary between providers and benefits will differ. A good licensed insurance agent will be able to advise you to buy the best insurance policy for those aged 51 years old and above.